Our lights are up and twinkling, the tree is decorated, shopping mostly done and presents wrapped. But somehow this year I feel like I'm simply going through the motions. My heart just isn't into the season, and while I have girlfriends pledging to induce holiday spirit, so far I'm not feeling it. Hence, the appropriate action seems to bake. Somehow mixing together flour and sugar always puts me into a better frame of mind, but add a little Grand Marnier and we have something special, don't we? Crunchy yet not crisp, these Triple Orange Biscotti have been a tradition on my holiday platters since the recipe release in 2003. Featured in Fine Cooking, Susan Betz's recipe has been made close to 30 times in my kitchen with yearly requests from neighbors and friends. 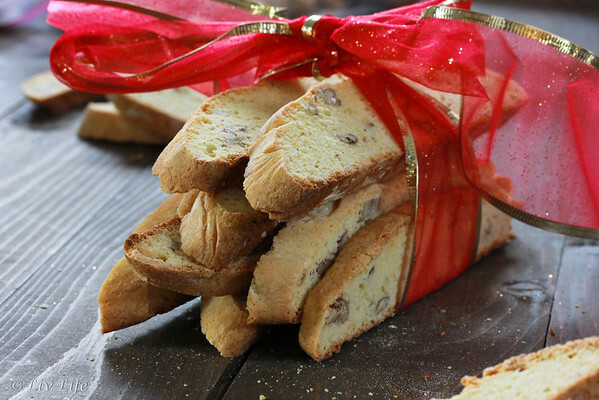 A lovely hostess gift or entry into a cookie exchange, the biscotti also works wonders alongside an afternoon cup of coffee. 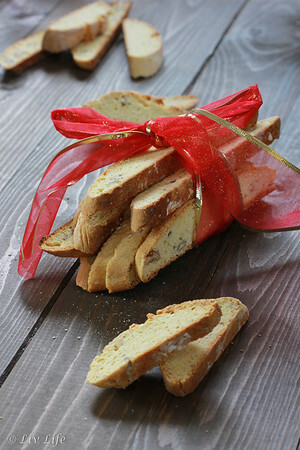 Adaptable and forgiving, I've "healthified" the cookies on occasion by reducing the oil and adding whole wheat or spelt flours, but for the holidays I usually stick to the original recipe and these bright biscotti induce smiles with every bite. The recipe comments the dough will be sticky... and be aware they really mean it. Sticky... very, very sticky - the dough almost seems slack, as if it will puddle off of the cookie sheet. But no worries, it won't. Attitude adjustment? I think we have success. 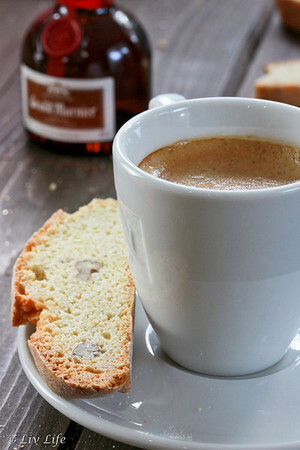 Delicate orange flavors meld into the perfect crunch with this Fine Cooking biscotti recipe. Note the dough is sticky and a little difficult to work with, but the end result makes it true winner. Preheat oven to 350ºF and prepare two baking sheets (with silicone mats, parchment paper or cooking spray). In a large bowl, whisk the flour with the sugar, baking powder and salt to combine. Put a bit of the flour mixture into a small bowl and add the orange zest. Rub the zest into the flour to keep it from clumping. Add the coated zest and the pecan back into the large bowl with the flour mixture and stir to combine. 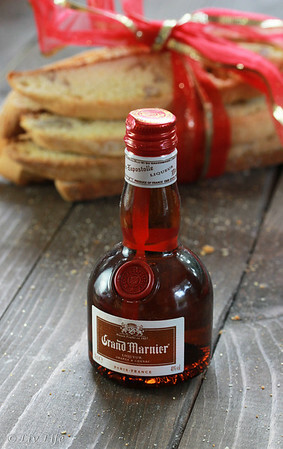 In a small bowl, whisk the eggs with the olive oil, orange juice and Grand Marnier until well blended. Pour into the center of the flour mixture and stir with a wooden spoon until the dough is blended. The dough will be very sticky. Dump the dough onto a heavily floured work surface and divide into six equal portions (Liv Life usually divides into 3 portions). Roll each portion into a log 12 inches long, dusting with flour along the way to keep the dough from sticking. Set the logs about 3 inches (Liv Life suggests even more!) apart on the prepared baking sheets and press gently to flatten each log so that it's 1 1/2 - 2 inches wide. Bake until the logs are golden and the tops are fairly firm near the center, 22 - 25 minutes, rotating the sheets and switching their positions after 10 minutes to ensure even baking. Set the sheets on racks until the logs are cool enough to handle, 20-30 minutes. Leave the oven set to 350º. Transfer the logs to a cutting board, and using a serrated knife, saw slices on a sharp diagonal into 1/2-inch thick slices. Arrange the slices on the baking sheet and bake the bistotti for about 6 minutes. Turn each biscotti over, then rotate the baking sheets. Bake until the biscotti are golden, another 8-10 minutes. Allow the cookies to cool on the baking sheets for about 5 minutes, then transfer to racks to cool completely. Note, the biscotti will crisp as they cool. Store at room temperature for freeze in an airtight container. Enjoy! Liv Life Note: As I found the dough to be challenging to handle I have, in the past, added extra flour. 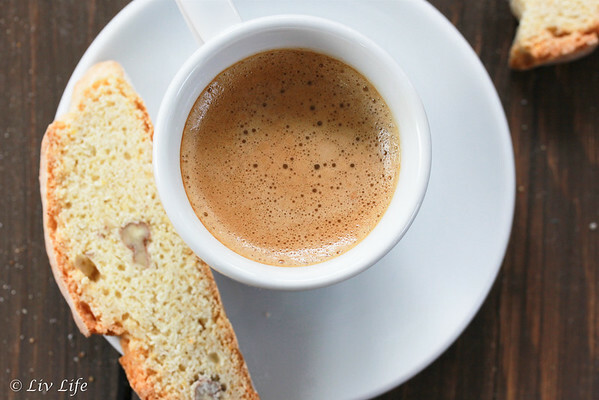 While this works fine, try to resist the urge to add large amounts of flour as the additional flour variations baked up a bit dry where the original Fine Cooking reicpe baked into a beautiful biscotti with no cracking on top of the logs. Liv Life Note 2: When baking the biscotti for the second time I stand my biscotti up rather than lay them on their side, this reduces the obligation to flip the cookies part way through the baking. Bake about the same amount of time, perhaps a few minutes shorter, but still until the biscotti are golden. Orange! Who wouldn't love orange treat for Christmas!